Tearing a pair of pants is annoying and possibly even expensive if they can't be repaired and need to be replaced. A pair of jeans for example, can cost anywhere from $20 to $4,000 and many people are prepared to pay $145 for a pair of jeans. Other designer pants are also expensive. Luckily, repairing a crotch tear is relatively simple and inexpensive. The way to repair it depends on the location of the tear. A tear along the seam can be sewn by machine or by hand. Other tears can be patched. Choose a color of thread that matches the color of the pants. Use a sewing machine or sew the seam by hand. Thread the needle for sewing the seam by hand. 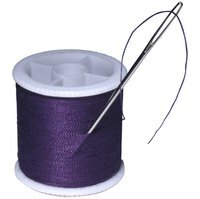 Use a piece of thread that is 3 feet long, or longer if the tear is large. Pull half of the thread through the eye of the needle, bring the ends together and tie a knot to anchor the thread in the fabric. Turn the pants inside out and locate the start of the seam tear. Push the needle through the seam before the tear and use a straight stitch to sew the seam. A straight stitch means pushing the needle in and out of the fabric in a straight line. Knot the thread at the other end of the seam tear by pushing the needle through and drawing the thread through until there is a small loop and then feeding the needle back through the loop. Patch a non-seam crotch tear with a matching color fabric patch available in fabric and sewing stores. Cut the patch so it is slightly larger than the tear and iron the patch on the inside of the pants over the tear. Bring the edges of the tear together before ironing on the patch.